Coasters make a very useful and decorative favour choice. They're destined to find a prominent place in your guests' homes while attractively saving the furniture from unsightly drink rings. And these coaster sets have mega winter appeal! 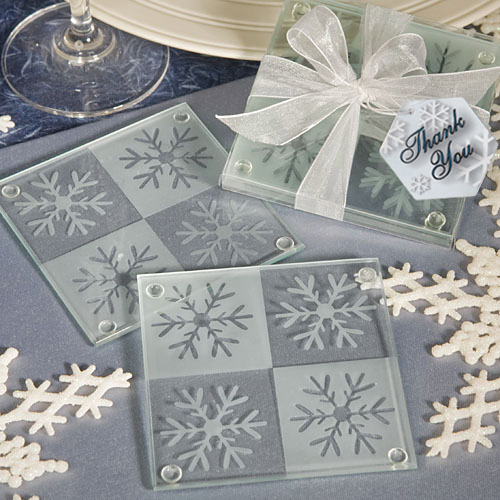 Each set contains a pair of 3.5" x 3.5" clear glass coasters featuring an etched snowflake design in an alternating frosted and clear checkerboard pattern. Each snowflake coaster set comes packaged in a clear box tied with a white organza bow and an attached snowflake design "For You" tag.